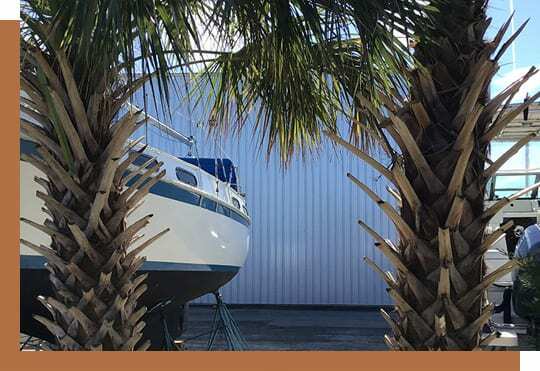 Welcome to Seven Seas Marina & Boatyard Inc.
An established business since 1980, Seven Seas Marina has been in the Boating Community for over 30 years. Tom Bush and Calvin Willard built their business on our local river, and take pride in passing on their passion to our community. Whether you're blocking the boat up for a Do-It-Yourself repair, putting it in the water for an afternoon excursion, passing through on vacation or something special like a family day on the water, we have the gear and expertise to help you enjoy the great outdoors. Based in Port Orange, we have easy access to the Intracoastal River as well as just a short walk to the world’s most famous beach with plenty of hot spots in the area. We offer a Do-It-Yourself boatyard and marina in one. Stackhouse dry storage, wet slip dockage, marine fuel supplier, marine supply store, with on-site washer/dryer, showers and restrooms. Partner with us to make your day, week, month, or year on a local waterway something special. Boating on an empty stomach? Enjoy the beautiful view as you relax at one of "Daytona's Best Kept Secret's". With a full menu to choose from, and breakfast all day, there's something for everyone at Pat's Cafe. Accessible by land or water, stop in, fill up, and go play. Warning: Come Hungry! Need some repairs, updates or a detailing? John Marrocco has been on-site for 30+ years and offers a wide range of marine repair capabilities such as fiberglass, gelcoat, rigging, topside/bottom paint and much much more. Put his expertise to work on that project that demands nothing less than perfection! Boat Storage. Home to a 66 slip Dry Storage Stackhouse. No dealing with trailers or ramps. Just call to have your boat put in and go! Ice and Fuel available on site. Haul Out. Blocking vessels up to 42' in length and 14' wide on land and a jib crane for removal of heavy marine equipment such as motors or masts. Store up front for all your boat repair needs. Storage/Dockage. Numerous slips available for Permanent or Transient Dockage. Restrooms, washer/dryer, showers, electric and even a ride to the grocery store to restock your supplies for you trip!